On Sunday Feb 21st, Karyn and Evan Turk hosted ‘Polo With A Purpose’ at the International Polo Club in Wellington. 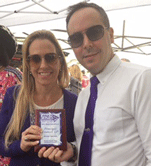 The event was to raise awareness and money for Alzheimer’s and the West Palm Beach Walk to End Alzheimer’s walk, to be held at City Place on October 8th, 2016. Over 100 people joined the group to learn about how they can help end Alzheimer’s. It was a beautiful day and the weather was perfect for stomping divots. “I am proud to serve as the Chair for this event, and to be an advocate for those living with Alzheimer’s”, said Amy Adaniel, “together with their families and caregivers”. “If you would like to join us at our walk, please contact me to start a team or search for a team to join. If you have questions, would like to be a part of our planning committee, or if you would like to be a sponsor at the Walk, please email me at adaniel@brightstarcare.com or call me at 561.921.0550”. Amy Adaniel is the owner of BrightStar Care of Delray Beach, providing caregivers for those living with Alzheimer’s and respite care for their families from Boca Raton to Boynton Beach Florida. Amy is a tireless advocate at the local and National levels, sponsoring, organizing and participating in Alzheimer’s events. To learn more about the Alzheimer’s Association and how they can help you, please go to www.alz.org.